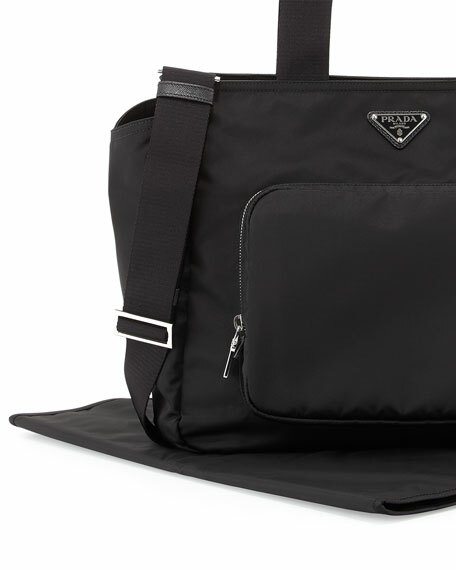 Prada durable nylon baby bag with silvertone hardware. Rolled top handles, 9.5" drop. Removable, adjustable shoulder strap, 18"-22" drop. Front and back zip pockets; two side slip pockets. Inside, logo jacquard lining; one zip and two slip pockets. 11.5"H x 14"W x 7.5"D.
Prada tote bag in saffiano leather. Flat top handle anchored by rings. Removable, adjustable crossbody strap. Open top with magnetic closure. Exterior, hanging logo tag. Logo at center front. Interior, contrast lining. 8.9"H x 8.5"W x 5.1"D. Made in Italy. Prada large tote bag in pebbled calf leather. Rolled top handles with hanging covered key ring. Removable, adjustable web and leather crossbody strap, 20" drop. Recessed zip top closure. Exterior, logo lettering at center front. 11.4"H x 13.6"W x 5.5"D. Imported. Prada large two-tone calf leather tote bag. Rolled top handles with hanging covered key ring. Removable, adjustable shoulder strap. Open top. 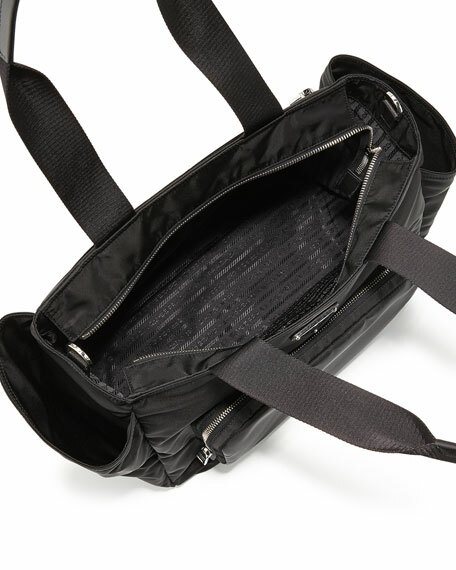 Front slip compartment. Interior, contrast suede lining. Removable leashed zip pouch. 10.6"H x 14"W x 6"D. Made in Italy. 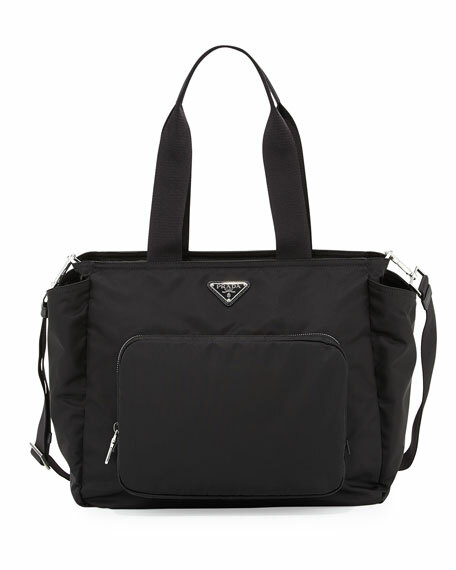 Prada nylon messenger bag with contrast leather and stud trim. Part of the Prada Black Nylon group. Adjustable studded shoulder strap. Flap top with buckled straps; snap closures. Exterior, front zip-around pocket with tassel pull. Logo at front; interior features pockets. 9"H x 10"W x 4"D. Made in Italy.